As elasticity in the skin wanes with age, lines and wrinkles can begin to form, especially in areas around the mouth that have frequent movement. The lines that run from the nose around the mouth on the nasolabial fold and from the corners of the mouth down the chin are often called laugh lines and marionette lines. These only become deeper as the skin ages. Dermal fillers can help smooth these lines, and Restylane Refyne is specifically designed to give a more youthful, natural appearance. Dr. Maurice Khosh is a dual board facial certified plastic surgeon that offers a wide variety of cosmetic procedures for our patients, including the Restylane line of dermal fillers. 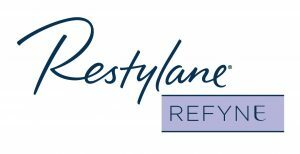 Restylane Refyne is a hyaluronic acid gel injectable that is FDA-approved to treat moderate to severe nasolabial folds and lines around the mouth. This can offer a softer, more youthful appearance for our patients in just one visit to our office with results that can last up to 12 months. Deep nasolabial lines are no laughing matter, making you look older, tired and even angry. Restylane Refyne offers a solution that quickly smooths those laugh lines without changing the natural expression of your face. This formula was created for those who want to look younger but still want to have the unique expressions that are a part of their persona. Refyne, created for a more natural effect, gives our patients access to more options to erase those lines while retaining flexible movement in the skin and muscles. If you want to look your best, come see our team, headed by Dr. Maurice Khosh. We have many cosmetic options to soften lines, smooth wrinkles and offer improved skin performance as you age, including Restylane Refyne injections. Contact us today to schedule your consultation with Dr. Khosh, and you can begin your journey to a more youthful appearance.